The main objective of this report is to analysis Production and Operation Management. Other objective of this report is to partial fulfillment of study on the Production and Operations Management in the perspective of Bangladesh. Finally this report make swot analysis Production and Operation Management. This report is required as a partial fulfillment of study on the Production and Operations Management in the perspective of Bangladesh. The study consists mainly on collecting primary data and secondary data from the company. The primary data was collected by interviewing the production manager of the company. The secondary data collected mainly from the Annual Reports of Needle Stitch. I also discussed with my respective course instructor to establish the structure of the report. A questionnaire containing both structured and unstructured questions was prepared, depending on the nature of the study. A Mobile recorder had also been used during the interview was taken. Operations management is defined as the design, operation and improvement of the systems that create and deliver the firm’s primary product and services. A concept in which different location within a facility are dedicated to different product lines. Each location is operated according to its own strategy to minimize the confusion associated with shorting from one type of strategy to another. Straddling occurs when a company seeks to match what a competitor is doing by adding features, services, or technologies to existing activities. This often creates problems if certain trade-offs need to be made. Order winner is a dimension that differentiates the products or services of one firm from those of another. Order qualifier is a dimension used to screen a product or service as a candidate for purchase. Productivity is a measure of how well resources are used. A set of measures that help managers evaluate a company’s economic performance and spot the need for changes in operations. KPI include financial measures such as days; cash on hand and operating income by unit or division ,as well as non-financial metrics such as average time to respond to service calls, lead time , or percentage of sales from new product. An organization capable of manufacturing and or purchasing all components needed to product or device. The thing that a firm can do better than its competitors. The goal is to have a core competency that yields a long-term competitive advantage to the company. It increases perceived customer benefits. It is hard for competitors to imitate. A process that helps a company determines the product characteristics important to the consumer and to evaluate its own product in relation to others. A matrix that helps a product design team translates customer requirements into operating and engineering goals. Analysis with the purpose of simplifying products and processes by achieving equivalent or better performance at a lower cost. Process is a set of activities performed by an organization that takes inputs and transforms them into outputs ideally of greater value to the organization than the original inputs. The average time between completions of successive units in a process. The term is sometimes used to mean the elapsed time between starting and completing a job. Utilization is the ratio of the time that a resource is actually activated relative to the time that it is available for use. The activities associated with a process affect one another so that it is important to consider the simultaneous performance of a number of activities, all operating at the same time. Buffering is a storage area between stages where the output of a stage is placed prior to being used in a downstream stage. Buffering allows the stage to operate independently. Blocking is the activities in the stage must stop because there is no place to deposit the item just completed. Starving is the activities in a stage must stop because there is no work. Bottleneck is a resource that limits the capacity or maximum output of the process. Make –to-order is a process that is activated only in response to an actual order. Make –to-stock is a process that produces standard products that are stored in finished goods inventory. The product is delivered quickly to the customer from the finished goods inventory. Hybrid is combines the features of both make-to-order and make to stock. Typically, a generic product is made and stocked at some point in the process. These generic units are customized in a final process to meet actual orders. Productivity is the ratio of output to input. Taking the dollar value of the output and dividing by the dollar value of the input usually measure total factor productivity. Run time is the time required to produce a batch of parts. Setup time is the time required to prepare a machine to make a particular item. Operation time is the sum of the setup time and run time for a batch of parts that are run on a machine. Throughput time is the average time that it takes a unit to move through an entire process. Usually the term lead time is used to the total time that it takes a customer to receive an order. 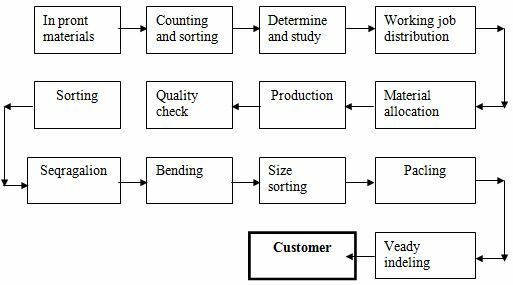 Process selection refers to the strategic decision of selection which kind of production process to have in the manufacturing plant. A process flow structure refers to how a factory organizes material flow using one or more of the process technologies just listed. A process structure suited for low-volume production of a great variety of nonstandard products. A process structure that produces a variety of standard products at relatively low volumes. The products are produced periodically in batches to educe the impact of setup time on equipment. A process structure designed to make discrete parts. Parts are moved through a set of specially designed workstations at a controlled rate. An often automated process structure that converts raw materials into finished product in one continuous process. Process layout also called a job-shop or functional layout. A format in which similar equipment or functions are grouped together. Product layout also called a flow-shop layout .equipment or work processes are arranged according to the progressive steps by which the product is made. The product remains at one location and equipment is moved to the product. Every one is an expert on services. We all think we know what we want from a service organization and by the very process of living. Services are idiosyncratic: what works well in providing one kind of service may disastrous in another. Quality of work is not quality of service. An auto dealership may do good work on your car, but it may take a week to get the job done. High contact services are experienced whereas goods are con summed. Effective management of service requires understanding of marketing personnel & operation. Services often take the form of cycles of encounters involving face-to-face, telephone, electromechanical and /or mail interaction. Facility Based service – Customer must go to the place of business. Field Based Service – Production & consumption take place in the customer’s environment. Services required supporting the activities of the larger organization. Buffered Core -Which is physically separated from the customer? Reactive System – Which is both penetrable and reactive to the customer’s requirements? The service flow chart- The flow chart of a service process emphasizing what is visible & what is not visible to the customer. Procedures that prevent mistakes from beginning defects .They are commonly found is manufacturing but also can be used in service processes. A promise of service satisfaction backed up by a set of actions that must be taken to fulfill the promise. Make it clear that you are happy for customers to invoke the guarantee. Total quality management may be defined as ‘managing the entire organization so that it excels on all dimensions of product and services that are important to the customer. A statistical term describes the quality goal of no more than four defects out of every million units. Also refers to a quality improvement philosophy and program. Apply a total system approach to changing the entire flow of information, material and service from raw materials supplier through factories and ware house to end customer. Moving some of a firm’s internal activities and decision responsibility to outside providers. The value of an item per pound of weight. Strategic capacity planning is determining the overall capacity level of capital intensive resource that best supports the company’s long-term competitive strategy. Best operating level is the level of capacity for which the process was designed and the volume of output at which average unit cost is minimized. Capacity utilization rate is measure how close a firm is to its best operating level. Increase volume of output, decrease per unit product cost. Increase volume of output, increase per unit cost. Requirements for a product or service caused by the demand for other products or services. This type of internal demand does not need a forecast, but can be calculated based on the demand for the other products or services. Demand that are not directly derived from the demand for other products. How large the order should be. To allow flexibility in production scheduling. To maintain safe guard for variation in raw material delivery time. To take advantage of economic purchase order size. Needle Stitch Factory location is 19/2 Nayabari, Savar, Dhaka-1340, Tel : +880-02-7741822. (E-mail : factory@textrimslinkbd.com). Needle Stitch is a private companies incorporated under the Companies Act, 1994 on 1996. The owners of the Company except Sponsors are the Bangladesh Shilpa Rin Shangstha (BSRS), Ministry of Textile, Government of the peoples Republic of Bangladesh, and Investment Corporation of Bangladesh (ICB), general public, local financial institutions and foreign portfolio investors. It is a ambotary factory and it has to the quality on supplying based on foreign market. Their main Market is abort. Needle Stitch mainly sells their product to the market through buying house. 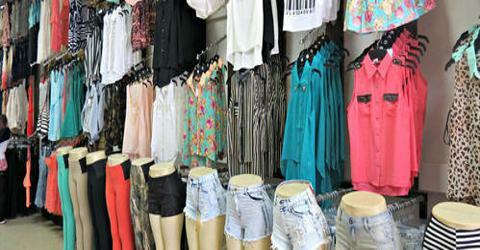 Sparrow Apparels has divided it organization into two zones – Head office zone and factory zone. The head office is in 30-A, Navana Garden, Kallyanpur, Dhaka-1207 and has 30 employees, and the mills have 50 workers who work two shifts a day. Philosophy feeds into value premises, which help shape vision. Vision is a stretching version of mission, and goals provide a way to pinpoint targets for achieving that mission. People should respect and trust each other in the organization. Contribution is the key to success and we believe in teamwork. An open discussion based on some following important questions were held between me and Md. Delower Hossain (Production Manager) on 20.06.2011 at the time of 10 am for the purpose to gain knowledge about the Garments sector in terms of the Production and Operations management. Me: Good morning sir. How are you? Md. Delower: Good morning. I am fine by the grace of Allah. Are you well? Me: I am also fine. 1. Sir, What is the competitive issue of your organization? What is the reason of selecting such a competitive issue? Ans. Price and Quality is the major competitive issue of one/four organization. Because now a days there are the two major elements or we can say major parameter to determine the profit and loss of organization. As open market economy supply and demand is to be balanced due to it supply is more than demand then cost of product will be loss or if demand is more than supply then artificial crisis will be raised. So it should be balanced and due to that it price is not competitive we will be out of the game how competitive and also the quality. It quality is not up to requirement of specific deigning than demand of the product world be loss. So consider the aster expiation we can say price and quality is the major competitive issue of an organization we need to be cost effective and quality not we mark. Comments: He is a very intelligent. But not higher educated parson. 2. What is the rate of new product development? Ans. Rate of new product development depends on demand and fulfill the depraves. So first every should be very specific on demand and expectation and based on that we should do market study and determined what new development of product would be more lacerative and what cost studs for development. So we have gone through world be more competitive and high demand. Comments: I say, he’s thinking is not good. 3. Is there any practice of process analysis? What is the result? Ans: Yes, there is practice of process analysis. Without process analysis. The production would not be successful and faithful as well. For better excellent on process analysis please see one designer which will be much more in details presentation about this analysis. In the garment sector, I think quality and price are the two important factors for making sense in the competitive market. Our main competitive issue is the Quality. We strictly maintain the quality of our products. We are in the market as for our quality products. We think nothing can be comparable to us like quality to compete and lead the market. For to compete in the global market quality is one of the major issue. Beside it, we also maintain price to lead the local market. 4. Get the facility location. Is there any study on present facility layout? Comments: It’s a very good facility layout. 5. Relevant information on productivity calculation. clear superfluous things and tools. All these result in clear and study workplace and better work environment. b) Ensure good hoarse keeping. c) Keep machines workplace etc. clear. d) Purse right work standard. 6. How the product quality is maintained? C) On line quality check. D) Individual liable for desire quality and standard. E) Motivation for better quality. Comments: There are good product quality maintained. 7. Is there any practice on supply chain strategy? Ans. Yes, supply chain strategy practice here that is from start to end very process men taint proper way to get better output. We also maintain supply chain management because it ensure minimum inventory and unless it there will be loss of market and low production. It maintains a link of all sectors of a production system. Comments: Yes, they aware about the supply chain strategy system. Because for customer satisfied and success his business. 8. The system of service encounter? Ans. Be responsible individual to his own one/four work and he punished or reordered for better and bead intent output. His permeable system running. Comments: His not good knowledge of service encounter. Service encounter is a interaction between service provider and customer and baffer core, permeable system and reactive system control. 9. Reason behind the facility location. Ans. Less investment, worker abundance, peaceful environment, less noise, less headache, very close to nature, optimum utilization of resource like energy, power, water, gas, less worker migration, self satisfaction. Comments : just I say, very good facility location and he’s business mind is very strong. 10, How forecasting on demand is calculated? Ans. Of course, we strictly maintain forecasting. To keep pace with the customer demand and to avoid the unexpected situations we forecast the market in quantitative way (by data) and then we produce. In order to create more forecasting level in our organization, basically order collection based on the customers are followed. Besides, for special occasion like Eid, Puja and other festival occasions are also targeted. Market study, new technical applied for better and face the new chotenge and always strive for better man. Comments: Forecasting is dependent demand and independent demand. Independent for forecasting. So there are maintain. 11. Inventory management system of the organization. Is there any application of automation on inventory management? And. Yes, mainly store inventory process system applied mainly manually keep all data record and every 3 month review the all record data and check every think properly maintain and utilization. 12. Is there any concept of order winner and core competency? Ans. Yes, reword for good job promotion here punishment for bed work canceling for better in future. We always trying to maintain to order winner and order qualifier in product market. Comments: He basically based on maintaining their order winner and order qualifier about their product and service market. The study done on Needle Stitch Company. was very insightful as it gives a first hand account of how POM is practiced in such large organizations in Bangladesh. It became evident through the study that administrative personnel in such organizations are quite aware of POM concepts. However limitation of resources often limits the level of benefits that can be achieved through such practice. One interesting issue that came up during the interviews and discussions is the method of customization of various Production and Operations Management concepts according to the need of the organization. Needle Stitch Company. is trying to provide the better quality or to maintain the customer satisfaction based on their expectations. Their infrastructure, physical evidence, procurement system and highly experienced personnel are the key factors for their “POWER OF TO ATTRACT CUSTOMERS”. They supply their products across the different districts in domestic market and exports in global market like Middle East, Europe. On the whole, Needle Stitch Company. can be seen as an ideal organization that is trying its best to adhere to the various concepts and implications of Production and Operations Management. There are still plenty of areas to improve and if those improvements are made then the company would become a leading institute in garment sector and an example for others to follow. The infrastructure is situated in front of main road. As a result, it causes sound pollution. Besides a foreigners demand is to have an environment with neat and clean. I think it would be better for them, if they transfer their offices to another environment where calm environment available. Production increase for some new machines buy necessary. Most of the workers are not highly trained. Besides, there is no any system to train them. Company size is not big, enough for its production. It should be extended. New and modern technology can be added in order to obtain more speed in the production system. Management level should be well trained with the help of highly skilled and specialist personnel for the purpose to make their sense as to be more effective and efficient in their daily activities.